In July, after enduring much heat and, for J., much humiliation (Cf this post), we headed to the beach. Although Shànghǎi, again which literally means “above the sea”, is on the sea, we never saw any of it, except perhaps from the plane shortly after taking off or before landing. Sānyà was very nice. Perfect beach, lovely sea. 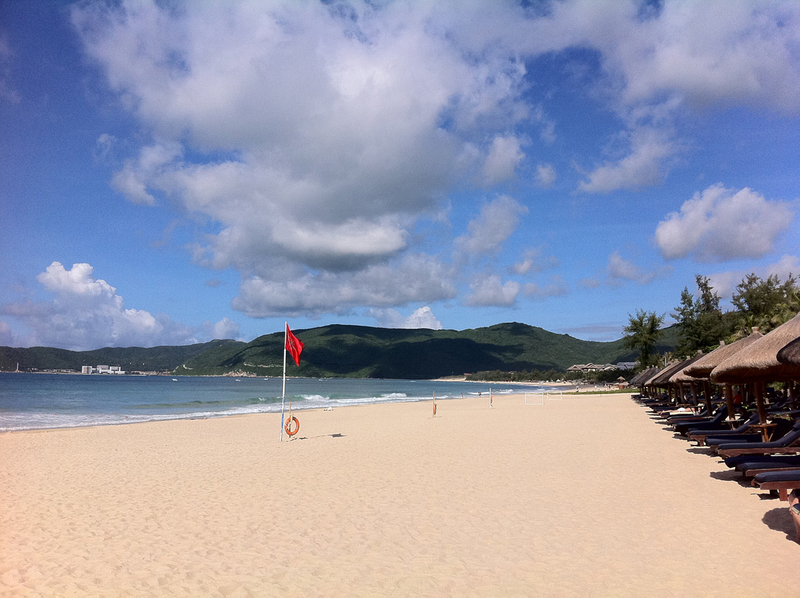 It’s a city on the island of Hǎinán, located to the south of China, just across Vietnam. Sānyà is on the sounthern tip of the island. We were very well advised by our friend and neighbour C., who had been there many many times. She told us not to bother doing any research and to go Yalong Bay, where the most beautiful beach of Hǎinán is and, out of the many hotels there, to head to the Mangrove Tree Resort. 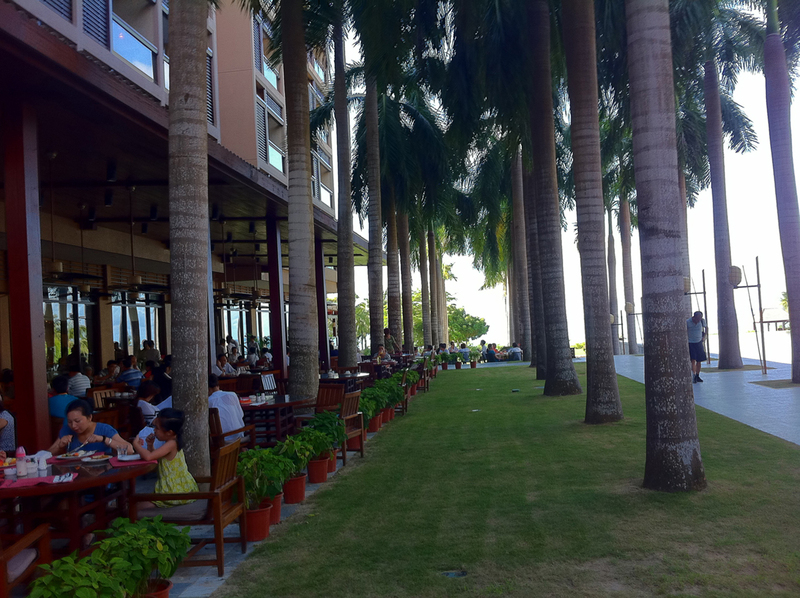 We did exactly as told and had a perfect time lazying in the sun and… observing middle class Chinese by the beach. Their behaviour is really contradictory! On one hand, most Asian people are known not to like being exposed to the sun. Being sun tanned is associated with working in the fields, which is in turn associated with the countryside and poverty. 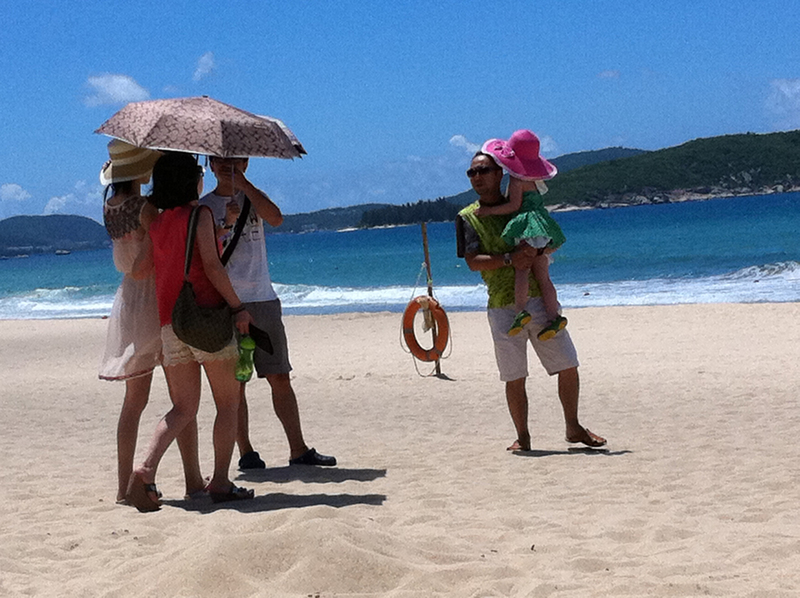 You will see many people in Shànghǎi walking with an umbrella on a sunny day. On the other, more and more middle class people are heading to the beach, in Sānyà and elsewhere in Asia, for their holidays, even though a fairly significant proportion of them (including people in their 30s) do not know how to swim. I can’t give a definite explanation to this rush to the seaside. But I suspect it may be a fashion imported from Europe (where it was also once frowned upon to be tanned). The fact that paid holidays are a very recent introduction to labour laws (initiated only in 1999 to boost domestic tourism) probably contributes to this too. Some of you may have seen pictures like the one below. Thankfully Sānyà wasn’t like this at all. 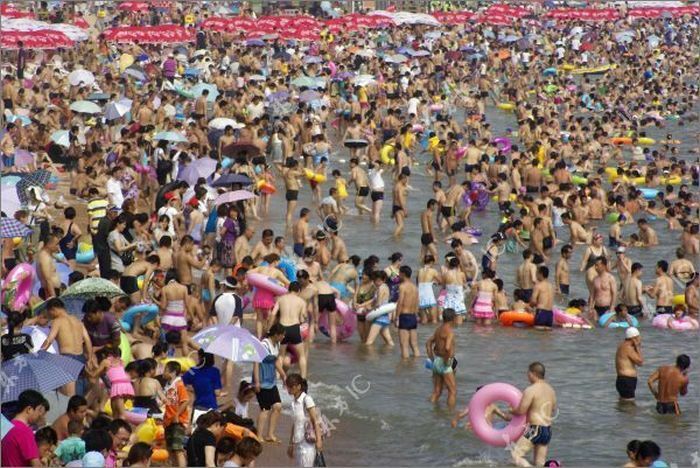 The beach, on a weekend in July, was practically empty, while the hotel was fully booked with 99% of customers being Chinese. 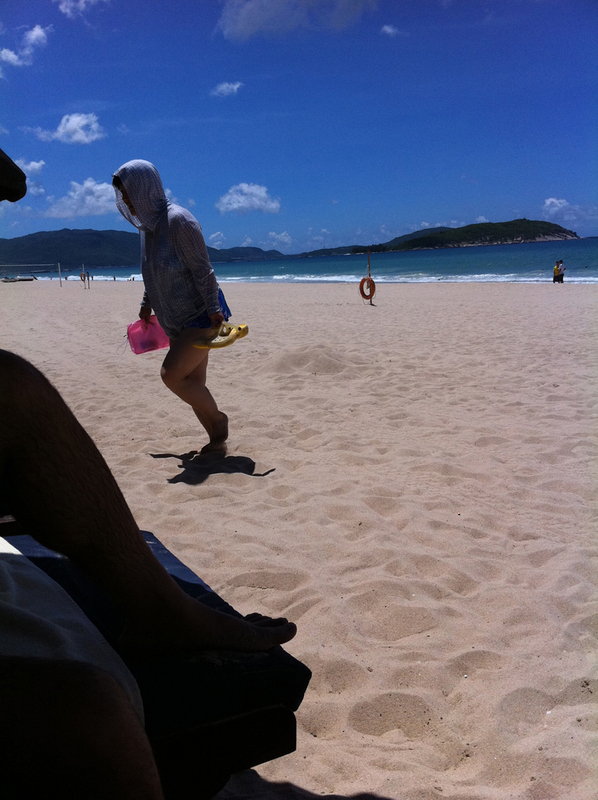 Those few Chinese who ventured to the beach did so with a lot of caution. A lot of them came fully dressed, maybe just to have a peak, considering that was enough to enjoy the sea. A whole other lot of them were in swimming suits and still used umbrellas to walk from their chaise longue to the water, perhaps even into the water. And some of them wore funky gear. Others were slightly more adventurous. 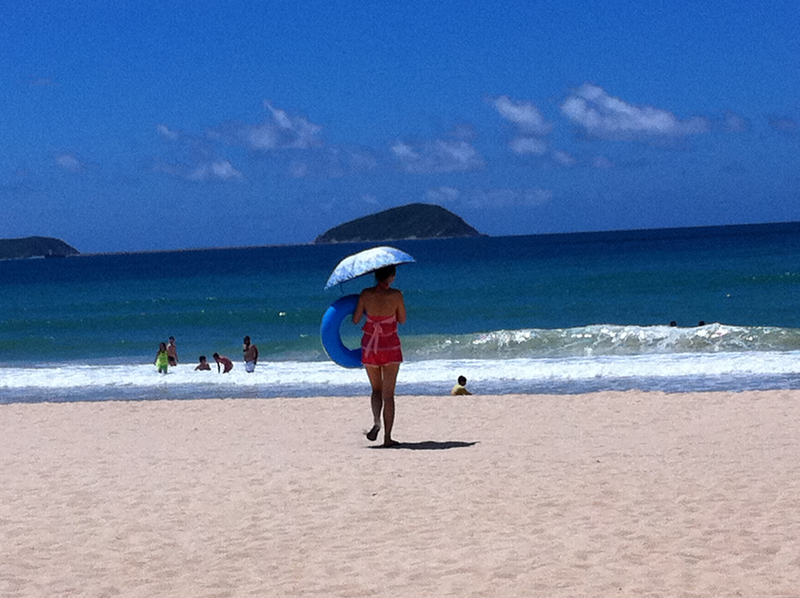 Those girls took pictures of one another under the umbrella, in the sea, with the view, etc. Could she swim at all? It has been proven that sun exposure can be quite harmful and I have stopped over exposing myself a long time ago. Maybe it’s just a slow process to be able to fully start lazying around nearly naked by the sea. 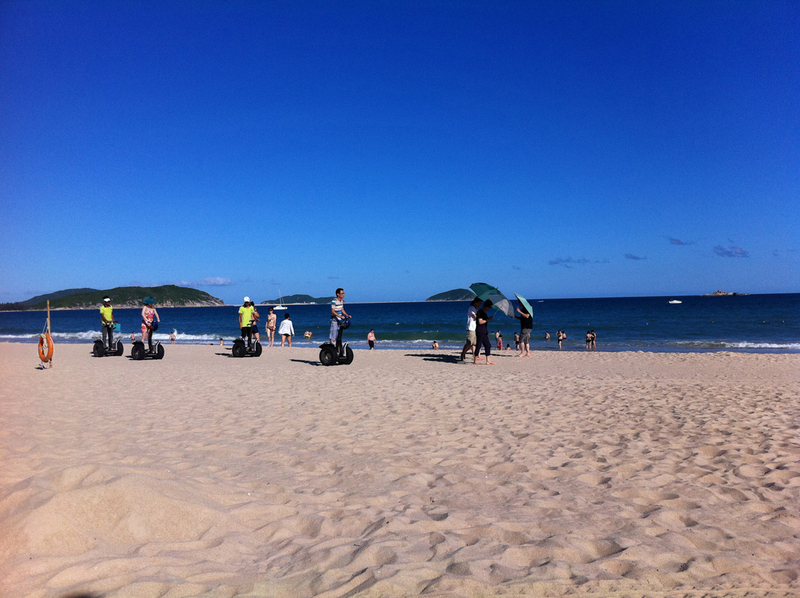 At the moment, Chinese people appear to be still too flustered and excited about seaside holiday to fully relax on their chaises longues.